Th'Faith Healers and Slowdive supported Lush. Eternal played just one live show. It was sometime in 1990 (the exact date seems to escape everyone’s memory), at a now nonexistent little club called Cartoon’s in Reading, England. The capacity for this club was said to be about 50 people, and there were about 30 people at the show. 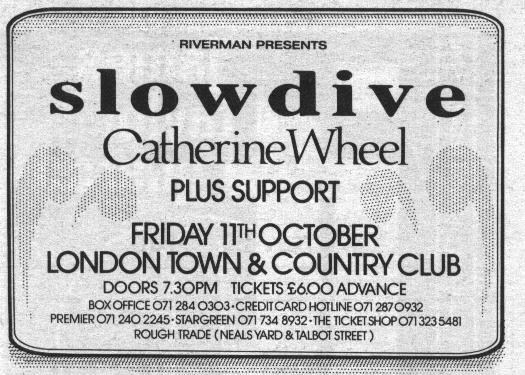 It was a triple bill with Eternal, Slowdive (well, also possibly still The Pumpkin Fairies at this point), and Chapterhouse. Eternal played 4 tunes; all the songs from the 7″ and an unreleased song at the end. There was a lot of tuning up between songs, sometimes lasting several minutes. When they went to play “sleep”, it was so out of tune that after about 45 seconds in they all stopped, the crowd giggled, and Christian went back to his lengthy tuning-up process, whereupon a minute or two later they burst into “sleep” anew and this time it sounded perfect. Thanks to Optic Nerve for sharing the advert scan. From user storm at dimeadozen.org: "Before bleed, Rachel says 'this is a new song called The Bleed' or something like that. I don't know that an official name for that song ever turned up anywhere so maybe that's the real name? Who knows"